A fast and effective method to evaluate the strength of trusses. 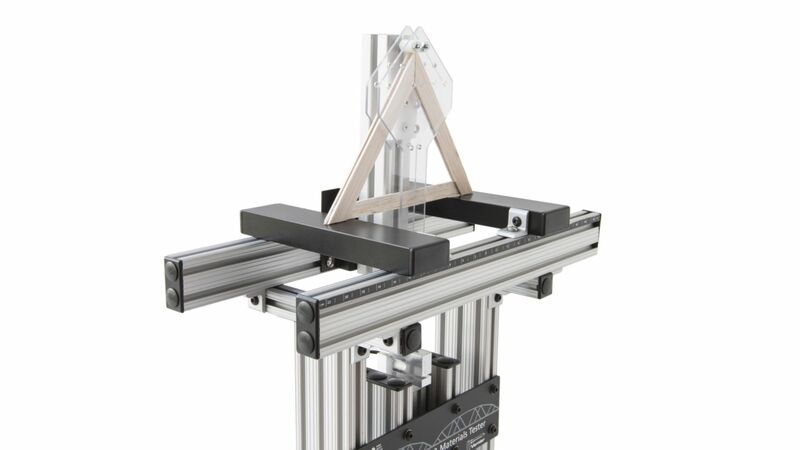 The Truss Tester Accessory for the Vernier Structures and Materials Tester (VSMT) provides a fast and effective method to evaluate the strength of trusses. Students use the tester to collect data that allows them to evaluate parameters affecting truss strength and apply engineering design principles to improve truss performance. This is a great tool for use in designing a truss-based bridge, tower, or other structure. The Truss Tester Accessory attaches to the VSMT to measure the force and deflection of trusses. The Truss Tester Accessory holds a single truss upright and allows the load to be applied in a variety of locations. Students can design their own investigations to determine how trusses fail and how truss performance can be improved. The accessory attaches quickly and securely to the VSMT frame and load cell. It is designed for trusses built with ¼" square balsa wood sticks with an 8" base and a maximum height of 7". Trusses can be top loaded, bottom loaded, or loaded on the slope of the truss structure. Use with truss brackets for quick and consistent truss construction. We have created a very simple corner bracket to assist in building trusses with ¼” square balsa. This allows students to quickly and efficiently build trusses to test in the Truss Tester Accessory without waiting for glue to dry. It also removes much of the variability students would encounter in constructing trusses from scratch. Two brackets come with the tester. A 3D printer file of the truss bracket is available if additional brackets are desired.